New York Boutiques 1 (Named in the game as just Boutiques) is a High-Wealth Commercial Services Building that grows on all Densities of Commercial zones. Jenkins Consulting uses the same model sets and can be considered a Commercial Offices variant of this building. 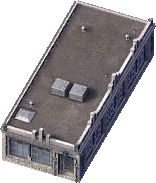 From the Exemplar name, it's likely that this building was only intended to grow in the New York tileset. This page was last modified on 10 May 2014, at 04:36.